The National Human Rights Commission will send letters to relevant nations to extradite the killers of Bangabandhu Sheikh Mujibur Rahman, said commission chairman, Kazi Reazul Huq, on Wednesday, August 15. “We must ensure judicial punishment for the killers of the father of the nation,” he said. 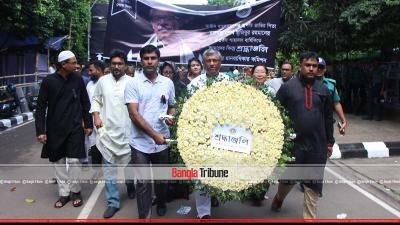 In the morning, the commission chairman and officials paid tribute to the image of Bangabandhu to mark the 43rd year of his martyrdom. Later, milad mehfil and prayers were offered at the commission followed by a discussion. “Without Bangabandhu, Bangladesh would never be formed and, today, we would not be in the exalted position globally,” said Kazi Reazul Huq. Bangabandhu or his family did not compromise on the issue of independence and we should unitedly work to build a poverty and hunger free golden Bengal as envisaged by Bangabandhu, he added.